Gavin Casella tackles Greenville’s Marcus Wood behind the line for a loss during first half action of Butler’s 37-21 win at Greenville Friday night. Nicholas Coyle stands up Greenville runner Tony Sells on a first quarter play. 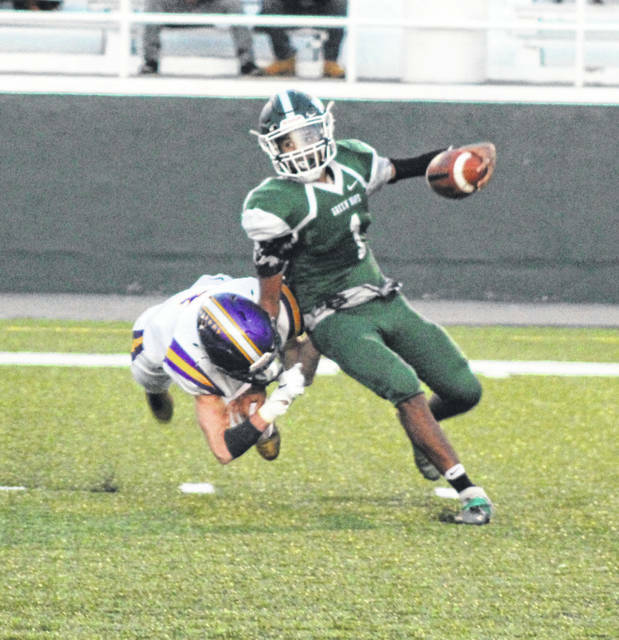 Butler withstood Greenville’s second-half rally for a 37-21 win. Ryan Martin dives forward for every yard he can with several Greenville defenders on his back during first-half action on Friday night. The Aviators win the game, 37-21. 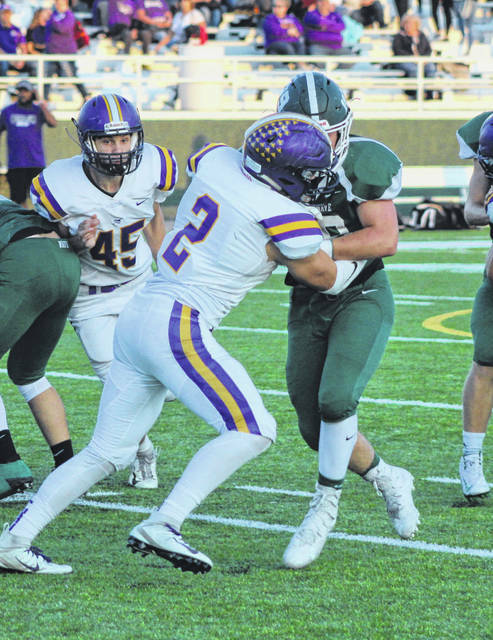 GREENVILLE – Though the players fought as hard as they could, Greenville’s second-half rally just wasn’t enough Friday night. 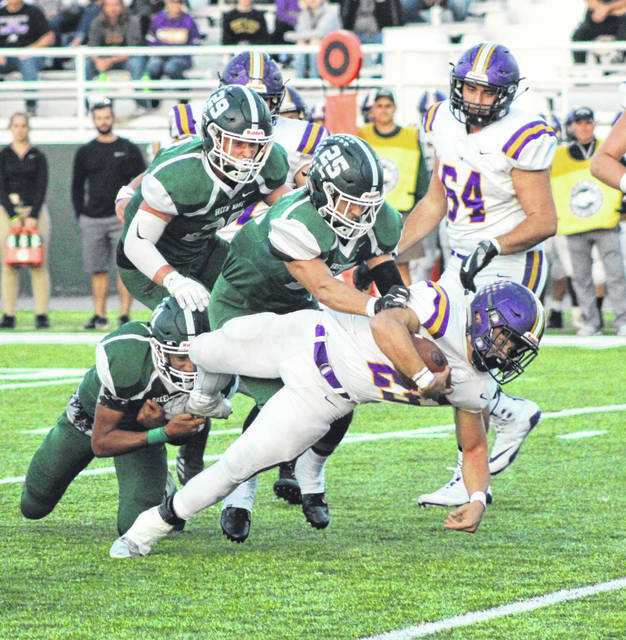 Vandalia Butler came to Harmon Field looking to spoil the Green Wave’s Homecoming festivities and did just that with a 37-21 win to open Greater Western Ohio Conference North Division play for both squads. Butler grabbed a 21-0 at halftime largely behind the efforts of running back Ryan Martin’s two touchdowns. Ryan Wilson also scored on a 7-yard touchdown pass from Mason Motter with just over a minute to go before the break for the three touchdown lead. Coming out of the locker room Andrew Boren kicked a 27-yard field goal to make it 24-0 in favor of the Aviators,but that’s when Greenville’s defense tightened up and its offense found its rhythm. First, the GHS defense came up big forcing a three-and-out possession for Butler. After the punt, Greenville completed a couple of passes to move the ball quickly down field and that’s when quarterback Tyler Beyke burst through the Butler defense breaking several tackles for a 34-yard touchdown run with 6:10 left in the third period. The extra-point kick failed however and the Aviators lead was 24-6. A few minutes later, Marcus Wood made several Butler defenders miss on a 65-yard punt return for a touchdown. He also caught the two-point conversion pass and suddenly Greenville was in striking distance, 24-14 with a full quarter and then some to play. However, Butler put together a long drive that carried into the fourth quarter and finished it off with Wilson on the receiving end of a 25-yard touchdown pass from Motter to put the Aviators back up by three scores, 31-14. Butler faced a crucial fourth down play during that scoring drive. They needed two yards to keep the drive alive deep in Greenville territory and got it. The next play was the touchdown pass. “We have seven seniors starting on offense and they executed when we needed to there which was good,” Butler coach John Puckett said. “I was glad to see that. We made a slight adjustment to a play and it turned out to be a big play. Greenville made it a game again with 5:54 left in the final period when Beyke found Colton Zumbrun open in the end zone for an 18-yard touchdown to get within 10 points at 31-21, but again, when they needed to, the Aviators offense put together a clock-killing drive that ended up with Martin’s third and final touchdown of the game on a 1-yard plunge. “When you get in that situation you have to get of the field and we did,” Shaffer said of the defensive stop early in the third quarter hat eventually led the Beyke’s touchdown run. “We talked in the locker room about being quick on defense and getting off the field so the offense can start putting some pressure back on them which we were able to do. In all, Martin was the go-to guy for Butler rushing for 299 yards on 43 carries and three touchdowns. Motter ran for 60 yards and also completed 8-of-16 passes for 91 yards and two touchdowns, both to Wilson who had 61 receiving yards on the night. For Greenville, Beyke was the leading rusher with 51 yards on six touches and a touchdown. He also completed 13-of-28 passes for 209 yards and a touchdown. John Butsch was the Wave’s leading receiver with six catches for 128 yards. Zumbrun had just the one reception for 18 yards and the touchdown. Greenville goes on the road to Piqua next Friday, while Butler returns home to host Troy. Reach Skip Weaver at sweaver@aimmediamidwest.